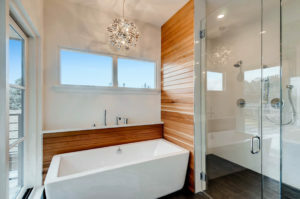 The design of a bathroom is one of the most difficult and vital aspects when it comes to building your dream home. Nevertheless, most of the people try to complete this aspect by themselves or just by doing a small research on the internet or by consulting the masons or other workers who were engaged with the construction so far. The ideal scenario should be a consultation of a qualified interior designer and evaluate his or her opinion followed by a feasibility study done by the investor and then proceed with the implantation. The following tips are considered to be commonly accepted reminders in such a scenario. Spacing is very vital since it usually has a small movement space which needs to be managed when all the bath ware and fittings are set in place. Fittings like appropriate hot tubs, sink or the shower area generally consumes more space than other bath ware fittings in the bathroom. Colour combinations is also another important element when it comes to bathroom designing unlike other areas of your house, this area has a unique background embedded to itself. It has tile work done right up to the walls of with a mirror on either of the sides which other places of your house would rather not have. The most important aspect of bathroom construction is the choice or the selection of fittings for the bathroom. This needs to be suited with the colours, space, durability, easy maintenance, and of course the affordability. Fittings like the shower equipment, hot tubs, sink, commode etc. consumes a vast amount of space while being costly and difficult to maintain. The next most important aspect is the lighting arrangements. This aspect will decide the elegance of the bath ware, the visibility of it. At the same time, the way in which the lighting is directed to the bathroom will also decide its elegance i.e. the door of the bathroom sometimes consist of a thick glass to allow flow of natural lighting etc. which should also needs to be considered. The shape of the sink, commode or the Jacuzzi can also give elegance to the area. If all three takes the shape of a circle it gives on type of an elegance while if it’s square the appearance differs. However, there are people who select those three fittings in different shapes to create a uniqueness although it is not quite recommended. Hope this article has given quite an insight to the people who are redesigning or constructing a house which needs these few areas to be taken into account. If you are looking for more relaxation fittings like massage chairs this link http://www.innovationsquare.com.au/category/Massage-Chairs.php can help you. What You Need To Know In Learning How To Fly?